Mystic Krewe of Nyx - Where strangers become Sisters! The Krewe of Nyx in New Orleans has earned the honor of being the biggest Mardi Gras parade in history. With over 3383 riders in its 2019 parade, the all-female krewe has broken barriers for the Super Krewes and has raised the bar for parades everywhere. First parading in 2012 with 534 riders, The Krewe of Nyx has made her mark in the pages of carnival history. It's membership has swelled due to the krewe's overwhelming popularity with locals and visitors of New Orleans in just seven short years. The Krewe colors of hot pink and black help the members feel connected to each other. They are part of the Nyx Sisterhood, which is a gem formed from bringing women together from all walks of life, from all across the country, and from around the world. Our members currently reside in 44 states and 3 different countries. More than just a parade, the Krewe of Nyx hosts social gatherings during the year that are optional for members to attend in order to further enhance the krewe's mission. Along with social activities that help form and seal the bonds of friendship and sisterhood, the krewe hosts fundraisers throughout the year in order to give back to the community. 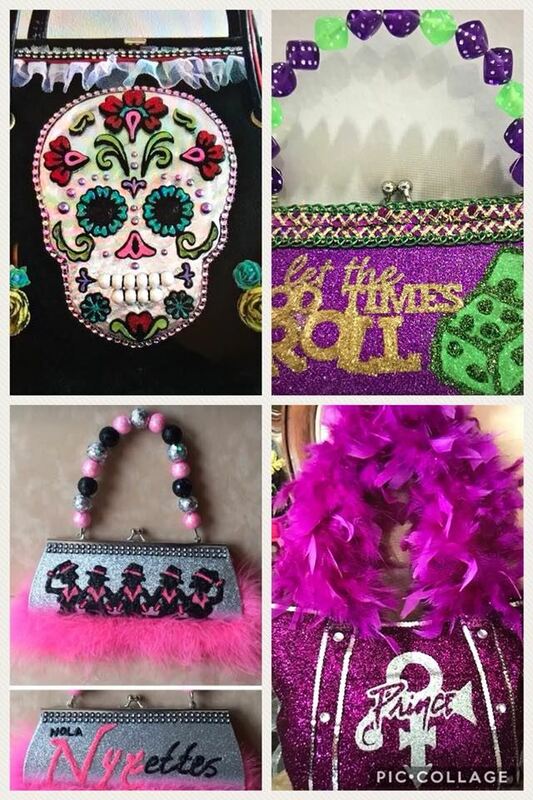 The Krewe of Nyx's special signature throw is hand decorated purses. Members will buy plain or old purses and spend countless hours decorating them with glitter, baubles, feathers, and other fun embellishments. These beautiful treasures are worked on all year long by members so they can have the experience of handing one of these coveted Krewe of Nyx purses to a person in the crowd. Having purse parties and get togethers at each others homes further cultivates the Nyx Sisterhood beyond the krewe hosted events. At decorating parties friendships are formed while glitter is flying and ideas are flowing. Between the Sisterhood, the purses, and the parade, Nyx has become the most sought after krewe to be a part of by thousands of women. Though the membership is currently closed, please check back for openings often. We invite you to come to see our parade on the Wednesday night before Mardi Gras each year as the Goddesses of the Night paint the skies of New Orleans Hot Pink and Black! 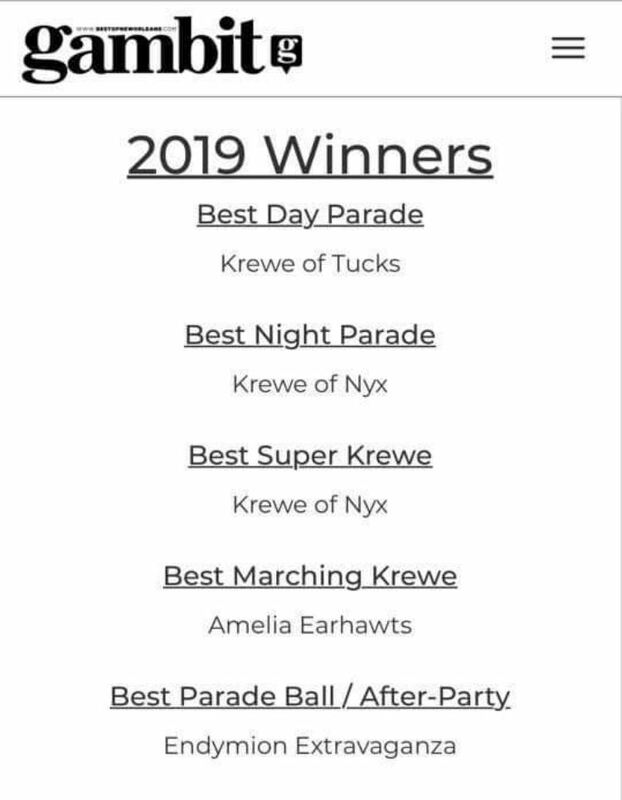 Our Krewe was honored by the Gambit reader's poll for Mardi Gras 2019 and won in two categories!! (nicks) was the goddess of night. Her name, synonymous with Night, describes how her dark light falls from the stars, and she dictates to men and also to the gods. Not even Zeus wanted to upset Nyx, as the stories go. She was one of the most powerful goddesses to be talked about in Greek mythology.